Scheduling shifts in the workplace has always been a difficult, rigid process. Balancing both employer and employee needs is always key, but getting everything to fit neatly, while ensuring that the business is properly staffed, has generally left employees most inconvenienced. Staffjoy is aiming to automate the process of scheduling shifts for businesses to help managers staff effectively, while allowing workers more freedom in determining their own schedules. Staffjoy is one of the first companies to launch out of Y Combinator’s new Fellowship program. Compared to YC’s full funding cycle, the fellowship operates quite a bit differently. At 8 weeks it’s a much shorter program, but the most important bit is that fellows receive a $12k equity-free grant from the company. The program is aimed at companies that are in the earliest stages of development. I had a chance to chat with Staffjoy co-founders Andrew Hess and Philip Thomas about their product and was able to check out a demo of the web app live in action. The app is largely focused on businesses having the “right people at the right time,” according to Thomas, but the manner in which it optimizes the employee experience is what really makes Staffjoy unique. 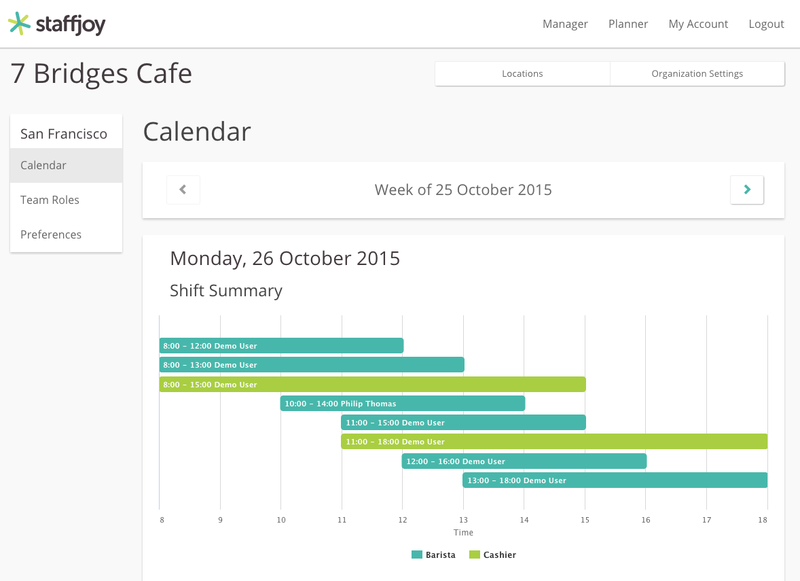 The app organizes shifts effectively by initially having employees enter their availability each week into the planner component of the app. The app then accounts for whether the worker is part-time or full-time and allows them to specify the appropriate number of hours that they’d like to work that week. “What’s great is that [employees] get to choose what hours they want through an easy-to-use web app that helps them claim available shifts easily,” Thomas said. After all of the data is entered, Staffjoy’s algorithm gets to work in sorting all of the employee availability into neat shifts that promote “a higher utilization of workers” and help managers get “the right people at the right time,” according to Thomas. Staffjoy has been testing their product at several businesses and Thomas said they’ve already seen some pretty amazing results. He pointed to one example where a business with around 50 employees was able to reduce its annual labor costs by $30k using Staffjoy’s automated scheduling tools. The app is currently mostly serving businesses in the on-demand economy, which seems to be a natural fit, but Thomas and Hess told me that they’re soon hoping to branch out into approaching more traditional mom-and-pop-stores to use their software. The team seemed quite aware that businesses like these can struggle with having too many available pieces of optimization software and said that they were already looking toward the future, hoping to pursue partnerships with other workplace apps so that Staffjoy could neatly integrate with other services. Right now, the app is serving firms with just a few employees as well as major on-demand companies with hundreds of contracted workers. The varying sizes of the businesses they’re serving right now are helping them see what models works best on a larger scale. Organizing shifts can be a tough task for employers, but Staffjoy is hoping that through automation they can produce a more fluid experience for workers and managers that doesn’t leave either of them in the dark.